A QUESTION mark hangs over the future of one of Lisburn's oldest schools after it was revealed the South Eastern Education and Library Board is consulting on whether it should close Derriaghy Primary. If closure is agreed the school, which has served people in the area from around 1794, could close in August 2011. Principal, Mrs Gladys Topping, said closing the school would be the wrong decision and would cause problems for the local community. She said: "The community it serves is a particularly disadvantaged one and a closure would cause hardship to many people. Parents are strongly opposed to the closure and have enlisted the help of local MP, MLAs and council members to help highlight the plight of the school." Mrs Topping, who first joined the school in 1992 and became Principal in 2000, said they currently have 45 pupils enrolled plus a pre school group operating in the building. She said closure would raise a number of serious issues including transport and nursery school provision. "The nearest controlled school is Seymour Hill Primary and that is one and a half miles away and would be difficult for many of the children to get to" she said. "Barnardos identified a need for pre-school and early years intervention in Milltown / Derriaghy and set up a mother and toddlers group in the School. They have issued us with a letter of support." The Principal said there is potential for the school to be re-located to the nearby North Lisburn feeder road area. "It would be short-sighted of the Board not to consider this given the amount of housing planned for the area" she pointed out. A spokesperson for SEELB said: "As part of its responsibility to manage the school estate responsibly, SEELB is reviewing schools against elements of the DE sustain-ability policy. 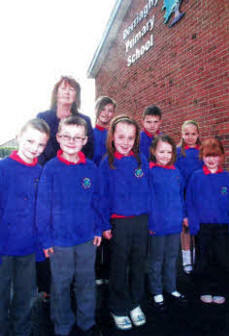 "Derriaghy Primary School has an enrolment of less than 50 pupils and is being considered. No decision has been taken yet and meetings have been held with Governors, Staff and Parents. "A report will be presented, before the Summer holidays, to the Commissioners. They will decide whether or not to publish a Development Proposal (DP) On school closure on some future agreed date. If such a proposal is published, a period of at least two months Public Consultation will be triggered culminating in a Ministerial Decision on the future of Derriaghy Primary School."